We've been so busy doing nothing the past few days! It's been bliss, actually. My Fuzzy Mabel replacement order came yesterday, and I have their package of returns all ready to go. I intend to keep these people on my favorite on line retailers list. You just can't beat them for customer service. The red socks that I knit for my brother's birthday were a smashing hit with him. I haven't seen them modeled, as I mailed them to him. In fact, I'm not sure that he's tried them on for fit yet. He was doing a lot of yard work for Mom when the package arrived, but just had to call and tell me how much he likes the socks. Sneaky little twerp was also calling to put in a request for a longer scarf! (We gave him one a couple of years ago that is only about 36 inches or so.) Only my baby brother could get away with putting in a knitting order! I've purchased Cascade 128 (bulky weight) in ruby and am currently working on a 2X2 scarf for dear brother. The yarn is nice and soft, and the color is great. The scarf is working up quickly, thank goodness. That K2 P2 is BORING to knit. I have a foccacia bread baking now (mmm....rosemary). The recipe is from Rachel Ray's new magazine, Everyday. The bread smells heavenly! Tomorrow will find me back at work. Big whoop! The past three weeks off has been wonderful. I intend to take it much easier on myself at work from here on out. If I don't, somebody slap me! I'd debated last week about whether or not to make an hour long drive to my favorite not so LYS. My mission was to buy more of my favorite Inox straight needles. Knowing that I'd spend much more than the cost of the needles, I decided the safe route was to order them on line and resist the temptations that great LYS holds. Carolyn has spoken favorably about Fuzzy Mabel in the past, so when I found them via Googling Inox Needles, I decided to give them a try. My package arrived today, and boy am I impressed. The priority mail shipping box was stuffed with nice lavendar tissue paper cradling another tissue paper wrapped bundle. Inside that bundle were my needles tucked safely inside a plastic bag. Wow. It was like opening a birthday present! To my dismay, three of my needles that were supposed to be 12 inches in length were actually 14 inches. I made a call to the store to tell them about this, and the nice lady who answered said she's shipping out my correct needles along with a mailing label (postage paid) so that I can return the incorrect needles. How's that for customer service? I'll definitely be shopping with Fuzzy Mabel again. 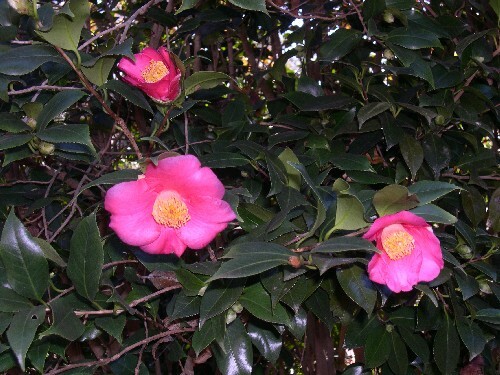 They are on St. Simons Island in GA, and if I ever make it there, a trip to the store is on my must do list! I had a nice morning at our LYS today--Knit Together. I stopped in for some DPNs for husband and ended up getting to help put up the Christmas tree and decorate it. The store carries some inspirational gifts including some ornaments, so we put on some of those, draped some sample scarves on the tree, and topped it with a knitted cap. I must say it is the best dressed tree in town! If time permits, I'm going to whip up some mini socks to take back over there. Daughter got into the act by arranging some gift item Harrisville knitting and weaving kits under the tree. Knit Together is such a comfortable place. It's like Cheers without the alcohol--everybody knows your name, and they're always glad to see you. If you ever find yourself in Augusta, do stop in to see the ladies at Knit Together. I'm making mini sweaters for teddy bears. I swore not to do any Christmas knitting, and I don't consider this a breach of my promise to myself. If I get the sweaters made in time for Christmas, then the neices and nephews will get dressed stuffed animals as part of their gift. If I don't get the sweaters made, then they'll get au natural stuffed animals! I love our yard. It's big and spacious, and it has established trees and shrubbery. 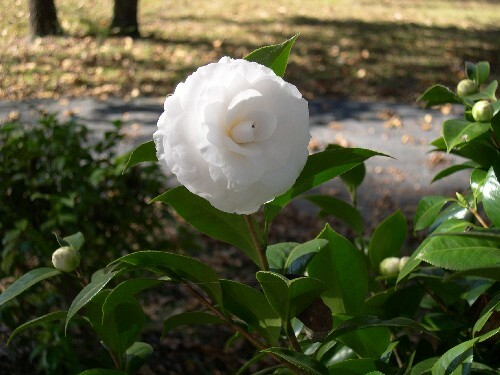 Here are a couple of pictures of the gorgeous camelias that are blooming now. In knitterly news, the felted hat is still drying. I think that's going to take days! I finished the first of my brother's birthday socks and have begun the second. I love the way the Wool of the Andes looks in socks. I hope they hold up well. 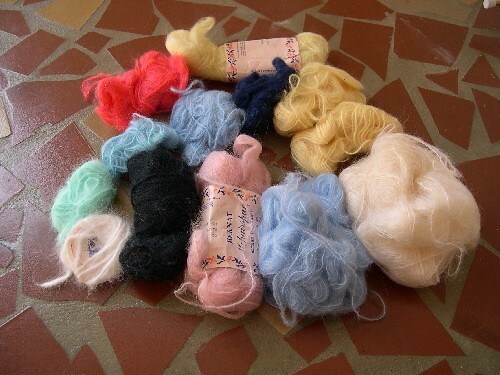 Here is a photo of the vintage mohair that I found at the thrift store recently. I have no idea what I'll do with it, but it was too good a deal to pass up! All this for just $3. There are a couple of tiny bits of angora in the left hand side of the photo. 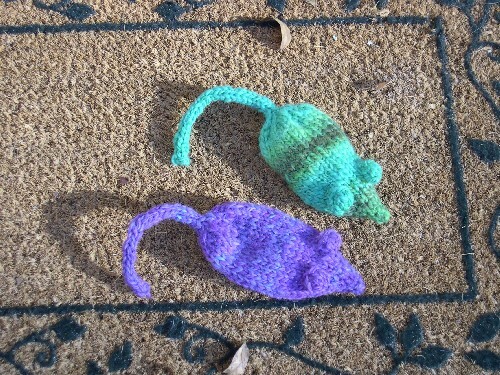 Here are some mice that I'm going to felt for the cats. The yarn is handspun from some fiber samples Danielle at NoNoKitty sent me to test spin this summer. Aren't the colors nice? That stripe in the green mouse was pure coincidence, but I think it gives him character! The fiber was nice to spin. Danielle does some beautiful things with color! Check out her yarns for sale on her web site. 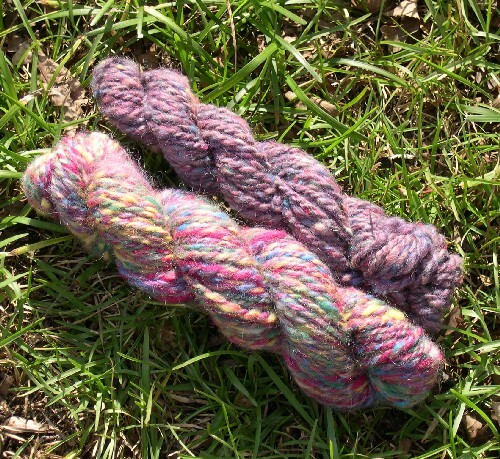 Finally, here is some lovely handspun bulky yarn made by husband, another person with a real flair for color. He enjoyed blending up this fiber on his new drum carder. I immediately claimed these two skeins. The photo does not do it justice! Husband is going to be teaching a dyeing class this week at our new LYS. I finally finished Cozy on Sunday but need to block her. I also felted daughter's hat that I knitted for her a month or so ago. It turned out great! On the needles right now are a pair of red boot socks for my brother's birthday. 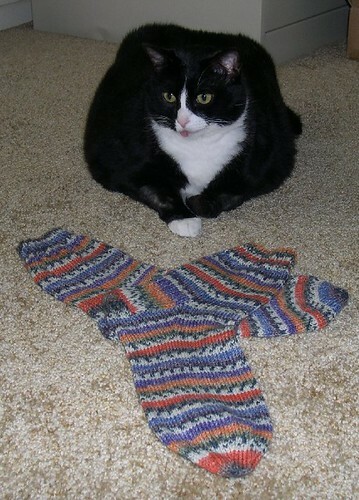 I'm using Knitpicks Wool of the Andes for the socks, and they are looking great! Pictures coming soon! No pictures tonight, but I could not go another day without telling you that I finally made a decent yarn haul at a thrift store! I found a bag (about zip lock gallon size) crammed full of vintage mohair yarn!! I only paid $3 for it. There were also some very small amounts of angora yarn, probably enough to make a scarf for some very fortunate stuffed animal. Hmmm....maybe if I knit Bobby Bear, I can give him a mohair scarf? We made it down to Wilde Fiber to see Tom and Jennifer. They have some gorgeous new yarn since I last visited in June. I scored four skeins of lovely Lorna's Laces for socks for me and daughter. Tomorrow starts my three week vacation from work. This is not a vacation to go any place, but an "all about me" time. My boss felt I needed a rest after all the hard work I've put in this year, and I must say I agree! I hope to do a lot of spinning and knitting, maybe some hanging out at the LYS, and perhaps a bit of canning, baking, and cooking lovely meals for the family. I like to cook, so that is not a chore to me. I also want to start riding my bike again. I'll do my best to get photos up within the next few days so that you can see my great yarn scores! I wasn't all that impressed with the Opal while making these socks. The yarn seemed very stiff. They are so soft now that they've been washed. Now that the socks are done, I'll get back onto Cozy and set a Thanksgiving finish date for her. I also feel like I need some new socks, so there is some Socklandscape from Knitpicks waiting to be cast on. I'm thinking about this pattern. I have had a few comments and e-mails so let me address those! The felted hat: No, it has not yet been felted. I've been too busy to do that, but soon! The PDA: My Tungsten E2 is doing just fine. I don't need the latest greatest, so it makes no difference to me if a new one came out. Besides, I don't do "waiting" very well. I want things NOW! We're heading to the beach this weekend. It's the first time I've been since June. We have an outlet mall shopping trip in mind, too, and I'm looking forward to that. I start a 3 week work vacation on Monday. It's been a hell of a year at work--no other way to put it--and I'm exhausted. My boss saw that and told me something has to give for my own well being. The company is giving me one week "free;" I'll take one week and three days from my time off bank; and two days are Thanksgiving holidays. I'm not one to let go, particularly when it comes to work, but I know that things are going to be in good hands in my absence. Hopefully, I'll be a happier and more productive person after my break! My boss requested husband's phone number so she can call and make sure I'm not sneaking work! (Remember, I'm regionally based and work from home.) I promise to be a good girl!